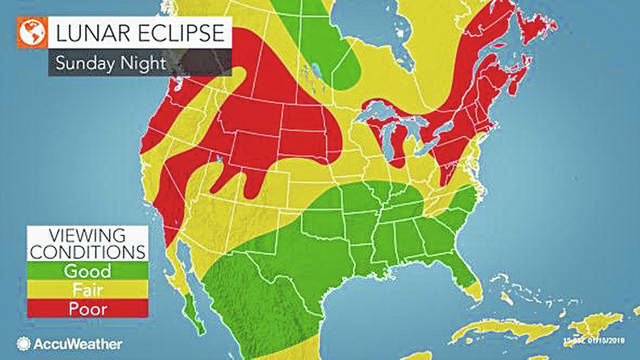 AccuWeather Global Weather Center — The moon will turn red over the United States, Sunday night, Jan. 20, during the last total lunar eclipse of the decade. “Although it’s a bit of a silly-sounding name, it does have a basis in some real phenomena,” said Caleb Scharf, director of astrobiology at Columbia University. The term, “blood moon,” has emerged in recent years due to the color the moon turns during the height of a total lunar eclipse. “‘Blood moon’ is not a term used in astronomy. It’s more of a popular phrase, perhaps because it sounds so dramatic. It simply refers to a ‘total lunar eclipse,’” according to the Old Farmer’s Almanac website. Preceding the terms, “supermoon” and “blood moon,” a full wolf moon is simply the name bestowed upon January’s full moon. “A pair of basic binoculars would be fun. You’ll definitely get more out of the experience,” Scharf said. Venus and Jupiter will appear side-by-side in the southeastern sky between 5 a.m. and sunrise. These planets will be hard to miss, as they are the brightest planets in the night sky.